“Otak Bruschetta, Curried Pie Dish”, these are just a few recipes that have emerged from the kitchen of Elaine Teng, who incorporates ethnic flavours into western dishes and merges two seemingly disparate foods into one. She fondly remembers her initial foray into the realm of cooking by following recipes and watching cooking programmes on cable television. She tweaks her kitchen know-how passed down through the generations and produces dishes of immense creativity which are not just a work of art, in appearance and design, but also appetising even to the most discerning taste bud. Elaine Teng has been a freelance Relocation Consultant with a multi-national company since 2013. Married with one adult daughter, she admits to spending most of her time in the kitchen. A self-confessed perfectionist, she cooks to please and nourish people and is like a magician who dispenses happiness through her dishes. She is passionate about creating time-tested recipes and sharing them with friends and family. Fusion cooking is her forte as it gives her the opportunity to diversify and try something new. Her recipes have been featured in food magazines like the BBC Goodfood (Asian Edition) and Xin Flavors since 2014. Her entry into volunteering has been quite recent. But she has indeed made tremendous strides since then. She joined RSVP in 2012. Her keen interest in cooking led her to be one of the pioneer members of RSVP’s Gourmet Activity Circle (GAC) along with Nancy Choo and Rowena Chin in October 2013. GAC brings together people who are passionate and enthusiastic about cooking. Initially, there were only about 15 participants. Despite setbacks like poor attendance, dwindling membership and inadequate kitchen facilities, GAC managed to overcome all obstacles with encouragement from our President Mr Koh Juay Meng and his wife, Fiona, who helped in almost every event hosted by GAC. Elaine reflects that the rough journey has proved invaluable as she has forged lasting friendships along the way. Today, GAC, with the help of all our chefs is immensely busy contributing towards several projects in community bonding. 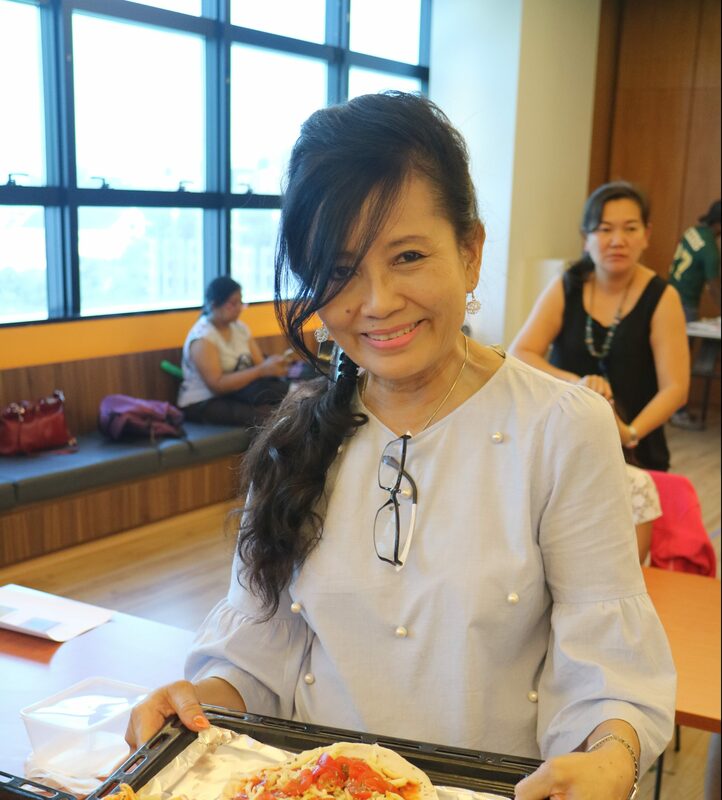 Elaine led the GAC in preparing Snow Skin Mooncakes as gifts to VIPs during the National Senior Volunteer Month. Her creative Snow Skin Mooncake classes have been part of the Corporate Social Responsibility project for PEC Ltd in 2016 and Credit Suisse in 2017. In 2013, Elaine joined the NUS Host Family Programme which was an RSVP-NUS collaborative project till 2015. Her family has actively hosted more than twenty international exchange students through cultural orientation and home cooking workshops. 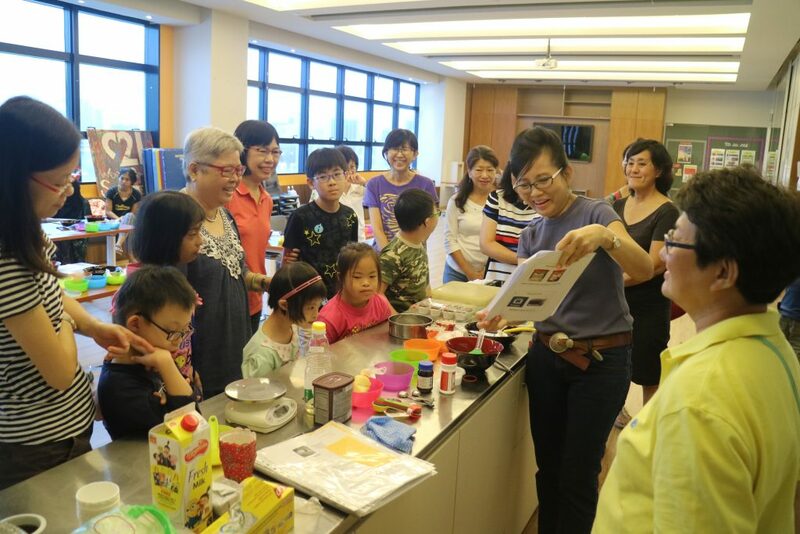 In 2014, along with close friend Rowena (an ex GAC Committee member), Elaine started running cooking and baking workshops for the Down Syndrome Association (DSA) students. This is a RSVP-DSA collaborative project which runs from June to December every year with help from volunteers and RSVP staff. Her experience with the Down Syndrome children has had a powerful impact on her life. The positive responses from the children have taught Elaine lessons on selflessness, unconditional love and patience. In September 2017, Marie Mattar roped in GAC Committee members and other volunteers to produce and publish the RSVP Cookbook. Elaine is thankful to Marie Mattar and Richard Cheong for including her in the organizing committee and fondly remembers the exciting times when she participated in the food photography sessions, the food tasting sessions, the press invite and the CookBook launch. Wearing so many hats at the same time has been no easy task. She laments that she often has to multi-task, as a good wife, mother, part-time relocation consultant, a recipe creator or an effective volunteer. Despite this, her culinary talents shine.